Don't forget to follow us on Instagram and Facebook @DJFBuilders! 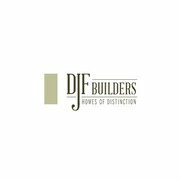 DJF Builders maintains the strongest commitment to the happiness of their clients. You can be confident that your home is perfected in every way until the final walkthrough, and the end result is your own architectural masterpiece. Clients are afforded a vast array of choices in home selection, from simply designed split plans to grand designs constructed from customized plans. 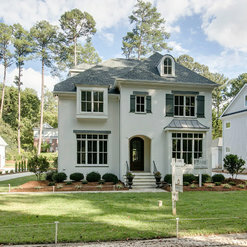 For over 22 years DJF Builders has proudly produced Wake County with “Homes Of Distinction”. Dennis Fitzgerald leads a professional group of skilled carpenters, on site superintendents and subcontractors that adhere to the highest standards in the industry. When you purchase one of our homes you are not just getting unsurpassed beauty in architecture, upgraded features and a hands-on builder – you are getting an exquisitely designed, fully functional dream home built on a foundation of integrity, trust and reliability. 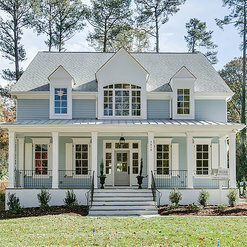 We proudly hold several award winning titles and memberships to the Homebuilders Association of Wake County, Apex Chamber of Commerce, Raleigh Chamber of Commerce, Holly Springs Chamber of Commerce, Parade of Homes, and Triangle Business Journal Fast 50 Award. My wife and I purchased a 'Spec House' from DJF in May of 2017. Prior to selecting this house, we looked at many homes throughout the area, and when we narrowed our search down to our top five or six homes - three of them were built by DJF. They build a great house! Final negotiations for the home were straightforward and done directly between myself and the DJF executives, Dennis Fitzgerald (the owner) and Chrissy Gupton (coordinator of everything). As with any 'Spec House' there are items that you want to change and add, having bought and sold houses before we detailed these items as best as we could. Key 'take-aways' from my DJF experience: 1.Your Project Manager Matters! Ours was Howard Patton, and I can't speak highly enough of him. He managed our 'finishing touches' with great precision and quality, if I were building a house I would request Howard. 2.The DJF team paid MORE attention to us after we closed on the property! This is certainly not typical, nor what I expected. We closed prior to a few outstanding items, Chrissy, Howard and the team were as, or more, responsive to us after we moved in. Chrissy in particular takes very seriously her goal of exceeding your expectations - something many people say, but very few practice over the long haul. She does, and it makes a HUGE difference. 3.I've never had a builder or contractor exceed what was in my mind for a project. DJF did - BIG TIME. When I walked Dennis and Chrissy through an area of the house and said, "I want the bar to come out over here and be like a stand-up bar, and here's where I want the wine cellar…" Their result was better than I could have imagined! (I've attached some pictures here that don't do it justice.) I can't say that DJF was the cheapest option we looked at, but I can say after living in the house for almost six months that we love it more today than when we bought it. We feel like we got a fair price for a great quality product that comes with continuing excellent service. I would recommend DJF homes to anyone considering buying, or building, a new home and I'm happy to speak with your directly about my experience if that is useful. As I begin to set words on this page, I must confess that I'm smiling...just grinning ear to ear because DJF Builders crafted a home that brings me joy and satisfaction each and every day. My experience as a client of theirs began when my family and I moved here from the west coast, following a job, in search of a house to call "home". We were quickly discouraged at the offerings in town...many needed significant upgrades and most were quite dark or peculiar in their layout. Our frustrations turned to hope when we were shown our future home as a spec build that was perhaps two-thirds completed at the time. 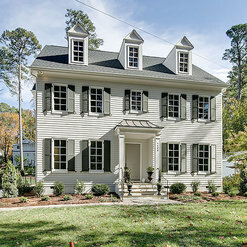 It was just a shell at the time, but we saw the beauty in it's design...everything was thoughtfully laid out and the property they were building on was a true gem in the belt line of Raleigh. It was the first house that excited us. Dennis Fitzgerald, the builder, allowed us to tour as much as we wished in order to make our decision to buy. We had a meeting with him and his incredibly talented on-staff designer, Chrissy Gupton. With the ease of true professionals, they presented their vision to us for the home. They didn't blink an eye when we asked about modifications to truly turn this into a custom build. They knew everything was possible one way or another. And we had confidence in that truth after touring other nearly-completed DJF homes. Chrissy was a master at putting my husband and I (and our children!) at ease, helping me discover my own personal style along the way. Chrissy was our guide every step of the process, helping me stay within our budget, offering up creative alternatives when I hit a mental block, interpreting construction lingo that was completely foreign to me, visiting tile shops/lighting shops/paint stores with me until we picked exactly what we were looking for, keeping oversight on all of our selections to be sure every choice flowed properly for the home, and answering every email/text/call with a smile and reassurance. We had never made selections for the build of a home before, so it was a daunting task...but that task turned into great fun as the project began with DJF's assistance. Everything was communicated to us...costs, timelines, etc. This continuous communication of information was another impressive skill of the company. Nothing was inflated or "sold" to us...we were always certain that what we were being told was accurate and timely, and, in the end, the choices were ours to make. It was a lovely way to experience what could have been a very anxious process. Before moving in, we toured other open houses just to get ideas on styling, and we were surprised at the quality of materials being used in our own versus the other homes...for the same cost. You can just feel and see the difference between standard materials and those of a more upscale nature...we enjoy our white marble counters, custom stained (almost whitewashed) floors, beautiful windows, effective heating + a/c management, luxurious fixtures, clever features (like our contemporary glass railings), and practical-yet-design-forward elements like an oversized screened-in porch overlooking our backyard with a window to our kitchen and an angled corner that allows for a special perch above the stone patio/fire pit below. Luckily, we were living as locals during this process, so I was able to visit the job site multiple times a week. I got to know the men and women who worked on site, as well as many of their vendors. I've learned that DJF works only with the best, most reliable individuals and companies in town. I felt welcome at all times and really enjoyed learning about the process. Being on site, I could literally see the care that the team put into their homes. The DJF brand is not something that happens by accident...the attention to detail - from structural design to construction and from interior finishes to external landscaping/lighting- was what impressed me most. I've had many people ask me what fell "short" after I moved into the home...because all new homes typically have some sort of incident that needs repair in the first year as things settle and the home is truly quality checked by being vigorously lived in by a family of five! The home is so well-built, that my queries were silly. I had to ask why a certain outlet wasn't working and the subsequent inspection by DJF showed me that the outlet was actually intended to power outdoor holiday lights (!). Who knew? The house had bells and whistles I wasn't even fully aware of! Any concern I've had under warranty or beyond warranty has been professionally and thoughtfully addressed right away. I've never felt anything but a part of the DJF family, in their home. DJF is proud of their work and we have a "forever relationship" with them now so that if we ever have to move, we will turn to them time and again for our home construction needs. I could end my review here...but if you are in the market for a new home, there seems never to be enough information online to properly asses such a large investment. So, I'll be a little excessive and share a few more details with you if you are still reading. In my experience, DJF takes full responsibility for their homes. They lovingly construct them from start to finish, appreciate their customers and their varied/unique styles-- being true to them all, and actually keeps budget in mind in every conversation. We had a very strict budget and ultimately didn't spend a penny more! However, we were still able to make adjustments as needed to craft a home most useful to us. We removed cabinets in a laundry room to make art space for children. We removed shelving in a utility closet to make room for charging upright vacuums and wrapping supplies. The dramatic living room fireplace we designed together is as practical as it is aesthetically pleasing, as a gas-starter wood-burning combination. And the mudroom which was to remain in our finished basement...well, we envisioned the kitchen as the hub of our family activity. So DJF commissioned a specialty cabinet maker to craft a large, 5- section, organizational dream, complete with shelves, hooks, and drawers, all neatly tucked away behind two heavy wood doors. It all looks seamless with our kitchen cabinets-- we couldn't live without it! We even had a special "hidden" fort constructed under the stairs in the playroom as a surprise for the kids along with two garden boxes built on property for spring/summer plantings. I think the builders had as much fun customizing the home as we did because they could see first-hand how happy we were with the results (and the effort to make it happen!). We moved in on time and trust DJF implicitly. We now live in a home that we appreciate day in and day out. It's a happy home. It's a safe, sturdy home. It's a beautiful home. Thank you, Team DJF! 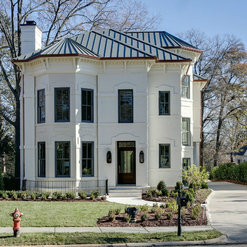 DJF Builders is one of the very best builders in the Triangle area - amazing design and best of quality construction. Highly recommend to anyone who is going to build a new home! Commented: Exterior Paint EdenSiding: Parma Gray No. 27 Trim: Extra White SW7006 Front Door: Railings No.31 Paint Thank you!